Despite what we’ve learned in recent years about the long term effects of fighting, hard hitting and cheap shots in pro hockey, there’s no denying that the foundation of the sport was built on the backs of “the enforcer”. When a team is down and their spirit is broken, they call on the almighty bruiser to run onto the battlefield and turn that momentum around. Whether it’s through a bone crushing hit that ignites the fans or a fight that shakes the confidence of their opponent, the goon brings that intangible that often isn’t measured on a score sheet. 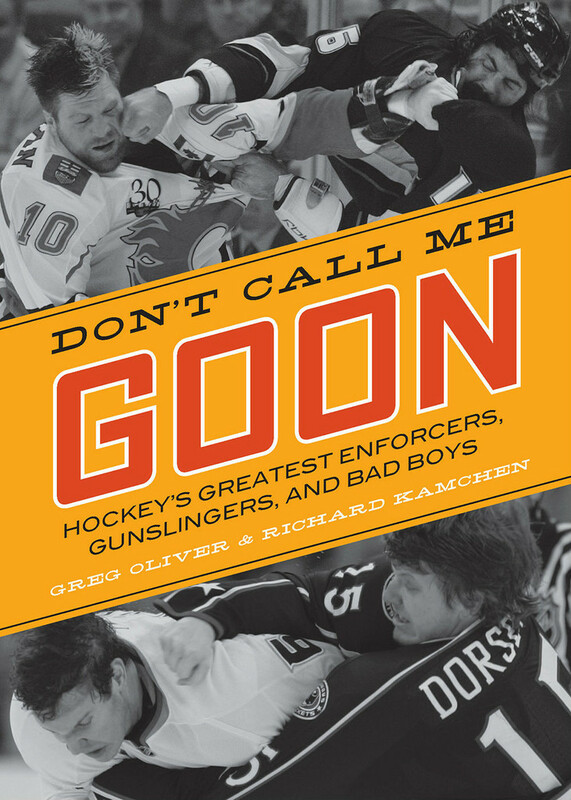 With “Don’t Call Me Goon”, co-authors Greg Oliver and Richard Kamchen present a look at a select few of the toughest guys to ever lace up a pair of skates. While the argument between those who want to keep fighting in the game and those who want it banished is ongoing, there’s no questioning the impact a physical player has on the ice. Whether he’s talking trash, eliminating an offensive threat or dropping his gloves for a round of fisticuffs, he’s often known to have just as big an impact as a go-ahead goal. Oliver and Kamchen do a great job tackling the early brawlers such as Joe Hall, Sprague Cleghorn and Red Horner as well as some of the heavy hitters of the original six era. However, I found the book really picked up when they moved into the expansion era. The punishing physical full team style pioneered by the St. Louis Blues and then adapted and perfected by the Broad Street Bullies Philadelphia Flyers had my jaw nearly hitting the floor. Players would often come down with a severe case of the Philly Flu, opting to sit it out rather than take that hellish beating the Bobby Clarke led squad would hand out. They were unstoppable from 1972 to 1978 when the equally destructive Montreal Canadiens would put an end to it. The book then moves through some of the greatest tag teams like the late Bob Probert, a one man wrecking crew and his running mate Joey Koncur. It was until these two arrived alongside the legendary Steve Yzerman that the Detroit Red Wings turned things around in the late 1980s. The authors shine a light on former Maple Leaf heavyweights Tiger Williams and Dan Maloney as well as Anaheim’s Stu “The Grim Reaper” Grimson and his buddy Todd Ewen. Oliver and Kamchen also take time to spotlight a few of the guys who could hit you as often as one of their shots would find the back of the net. Explosive multi-dimensional players like Clark Gillies and Wilf Paiement show that some ruffians are more than hitting machines. Overall, I thought they presented an unbiased look at a few of hockey’s most memorable players. While it would be impossible to write a book about physical style hockey and not shed a light on the controversy it creates, both Oliver and Kamchen kept things light and managed to avoid having an opinion either way. Don’t Call Me Goon is a swift punch in the face that won’t make you feel like you’re watching the clock, waiting for your penalty to end. November 30, 2013 in Greg Oliver, Non-Fiction, Richard Kamchen.